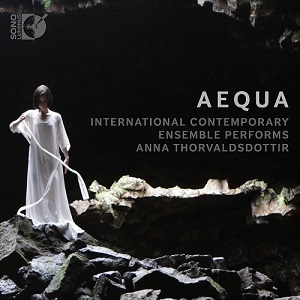 A new portrait album of the music of Anna Thorvaldsdottir is released on the Sono Luminus label on November 16. AEQUA features a selection of recent solo, chamber and ensemble works performed by the composer’s long-time collaborators International Contemporary Ensemble. The focal point of the album is aequilibria for 12 players, written in 2014 and recorded here for the first time, which was inspired by the concept of balance between opposing forces. Similar qualities are to be found in the pieces that surround it, ranging from Scape for solo piano to the string trios Spectra and Reflections, and Illumine for string ensemble, which was commissioned by Ensemble Intercontemporain in 2016. My music is often inspired in an important way by nature and its many qualities, but I do not strive to describe or literally incorporate elements from nature in my music. To me, the qualities of the music are first and foremost musical — so when I am inspired by a particular element that I perceive in nature, it is because I perceive it as musically interesting. …Aequilibria was inspired by various states of balancing forces — by the natural breath between expansion and contraction, and the perspectives of translucence and opacity. This inspiration can be applied to the whole collection of pieces on AEQUA — the works breathe in and out of focus, expand and contract within their individual characters but reflect on each other through their various internal connections from beginning to end. This is ICE’s second portrait album of Thorvaldsdottir’s music, following the release of In the Light of Air in 2015. The physical package includes both CD and Pure Audio Blu- ray with 9.1 Auro-3D, Dolby Atmos 5.1.4, and 5.1 Surround Sound versions, as well as the mShuttle application containing FLAC, WAV, and MP3 audio files. Icelandic composer Anna Thorvaldsdottir is the recipient of the Nordic Council Music Prize 2012 for her work Dreaming, the New York Philharmonic's Kravis Emerging Composer Award in 2015, and Lincoln Center’s 2018 Emerging Artist Award and 2018 Martin E. Segal Award. Her music has been performed by leading international ensembles including the New York Philharmonic, Los Angeles Philharmonic, London's Philharmonia Orchestra, NDR Elbphilharmonie, Vienna Radio Symphony Orchestra, Royal Stockholm Philharmonic and Oslo Philharmonic. Her debut album Rhízōma was released on Innova Records in 2011, followed by Aerial on Deutsche Grammophon in 2014 and In the Light of Air on Sono Luminus in 2015. In 2018 she was appointed Composer in Residence with the Iceland Symphony Orchestra held residencies at Njord Biennale in Copenhagen and Zeitgenuss festival in Karlsruhe, Germany, her latest orchestral work, METACOSMOS, was premiered by the New York Philharmonic, while AERIALITY received its thirtieth performance since its premiere in 2011. Thorvaldsdottir is currently working on a major new piece for Gothenburg Symphony Orchestra and Iceland Symphony Orchestra for premiere in May 2019.